The Paris agreement is essentially a promise to make real promises later. It is a positive development that the nations of the world agree to try harder (later, as promised). One key improvement over past Conferences of the Parties (COP) is that China (a so-called Developing Nation, even though it is the top emitter) has finally been joined with the U.S. and other Developed Nations, as to taking responsibility. Another happy development is that reference is now made to 1.5 degrees Celsius, as preferable to 2 degrees for a global warming limit. However, since the world has already warmed over 1 degree since the Industrial Revolution, and there is more than another degree in the pipeline due to climate lag (the 40-year delay from emissions to noticeable effects), the 2-degree goal — let alone a 1.5-degree goal — cannot be achieved without rolling back industrialism and deforestation. As the celebrated climate scientist James Hansen pointed out, a major weakness of the COP process is that it relies on individual countries’ attempts. Without a universal approach such as a carbon fee, he sees failure stemming from unfounded optimism for what he considers a false promise. 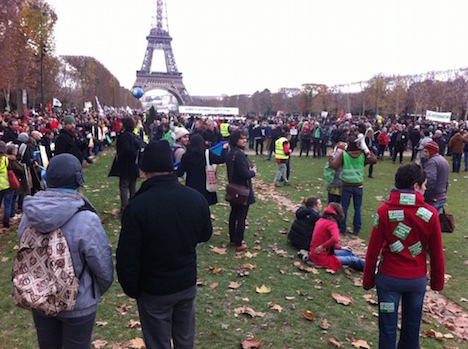 However, COP21 did work in bringing together organizations and civil society from around the world, demonstrating that a global movement to respect and protect our planet is reaching beyond politics. And several progressive movements participating in the COP have made strides in linking together essential models of sustainability: permaculture, ecovillages, greater participation of women, Transition, anti-nuclear, human-powered transportation, and sail transport (to name just several). The present Agreement is non-binding, and relies only on future nation-by-nation goodwill, along with incentives for some, to tighten climate protection every five years in new Agreements. Despite this, many have celebrated the intentions and promises of the latest Agreement, holding out hope that promises and intentions will prevail. This would be especially valid, despite the established trends of global warming, if this were decades ago instead of now at this late date in the direction of the changing climate. Almost everyone who has focused on the Paris climate talks and the United Nations Agreement of Dec. 12 has looked at the big picture: will our planets viability be secured for a large population beyond this century? Good question, so activists and scientists have tried to pressure governments (who are loyal first to industrial interests) to save us.� Others took to the streets to demand climate justice. And some look to the sea. Uniquely, the sail transport movement and anyone concerned about maritime shipping emissions— not covered in the new Agreement — had a specific mission in the run-up to Paris and during the conference. We came with two areas of concern: the International Maritime Organization (IMO) had long failed to adhere to the intentions of the UN climate goals, ever since Kyoto in 1997. Secondly, the obvious and clean alternative to marine bunker fuels (the dirtiest petroleum) — sail technology — was and remains unacknowledged. SAIL MED and STN was present with a booth for the entire COP21, and circulated our suggested language to the Dec. 5th draft Agreement which would modify an existing paragraph dedicated to shipping and aviation emissions. Our suggested language was widely acknowledged and tweeted in the shipping community and amongst organizations fighting for similar causes. As we published in an widely shared article, ”Shipping Emissions Must Be Tackled at COP21 with Advances such as Sail Power” (STN), our language sought to not just reference the IMO but to hold them also accountable to the overall UN commitment. We also specified alternatives “such as sail technology” — a potentially historic change in global policy. But then politics played a dirtier hand. Maritime shipping emissions were removed from the final language of the Paris Agreement. Section 20 of the Dec. 5th draft Agreement somehow vanished a few days before the ending Agreement. This suddenly served to call urgent attention to the issue up and down the levels of power. But GHG emissions from shipping still remained off the radar. Almost as much as before, what is happening on the world’s high seas is out of sight, out of mind. Granted, the Paris Agreement was a positive development for the nations of the world to agree to deal with global warming more seriously. For our part, we anticipate shipping emissions to be more strongly addressed in the next year, including in several countries’ Intended Nationally Determined Contributions that attach to an eventual modified Agreement. Fortunately, representatives of the IMO heard more than their earful from stakeholders and organizations who are not pleased with business as usual in the shipping industry. But short-term economic advantages are still dominating heavy decision-making in shipping. Forward looking leaders are needed in greater number, to join the pro-sail power/pro-ocean sanctuary Marshall Islands’ Foreign Minister Tony de Brum. Building on our progress in Paris which was noted by two highly involved veterans of COP meetings, we will join with any determined foes of shipping emissions and with supporters of sail technology. Again, our twin approach is for certain Parties such as island nations to step forward for international renewable-energy funding that can include sail power, and to promote the inclusion of stronger shipping-emissions controls into further UN and IMO agreements, regulations and individual country commitments. For us this means following up with our large and growing number of receptive contacts early in the new year, and getting ready to participate in the Marrakech COP22. We will keep participating in other clean shipping conferences and meetings, as we have since 2013, in order to promote truly sustainable shipping — not just in the political sector but in the private sector and with other stakeholders as well. We hope to see you and work with you! Meanwhile, we note the faster pace of progress for the sail transport movement. There are more and more projects, and STN will continue to inspire more of them and provide assistance as we have since 1999. Stay tuned in 2016. 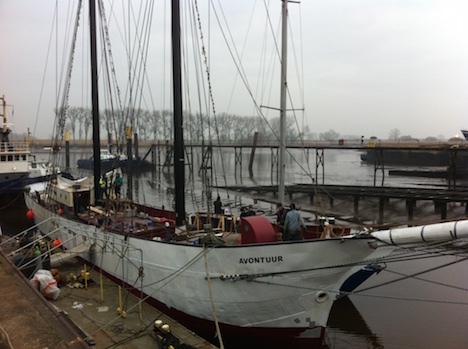 The Avontuur, steel 44-meter schooner being readied for sustainable cargo duty in the South Pacific. The engine will basically be for getting into and out of harbors. SAIL MED webpages on COP21: draft language for shipping-emissions, poster on display in Paris, and flyer supplied to UN delegates. Ecoliner, developed by the SAIL consortium of 7 North Sea nations. See the results of its EU-grant study findings. 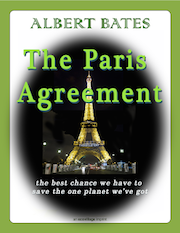 UN-accredited speaker on ecovillages and sail-transport proponent Albert Bates' blogs on COP21 — now available as an e-book and in print at CreateSpace.com, an Amazon company.